Charles H. Hapgood Mystery in Acambaro: Did Dinosaurs Survive Until Recently? Mystery in Acambaro: Did Dinosaurs Survive Until Recently? The Acambaro collection comprises hundreds of clay figurines that are apparently thousands of years old; however, they depict such bizarre animals and scenes that most archaeologists dismiss them as an elaborate hoax. The collection shows humans interacting with dinosaurs and various other 'monsters' such as horned men. 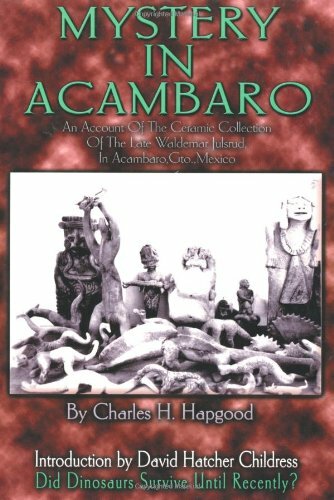 Both Hapgood and Earl Stanley Gardner were convinced that the figurines from Acambaro were authentic ancient artifacts that indicated that men and dinosaurs had cohabited together in the recent past, and that dinosaurs had not become extinct many millions of years ago as commonly thought. David Hatcher Childress writes a lengthy introduction concerning Acambaro, the latest testing, and other evidence of 'living' dinosaurs. Charles Hapgood was a professor at the University of New Hampshire and wrote numerous books, including Maps of the Ancient Sea Kings, which won an Amazon.com award for Best Atlas.